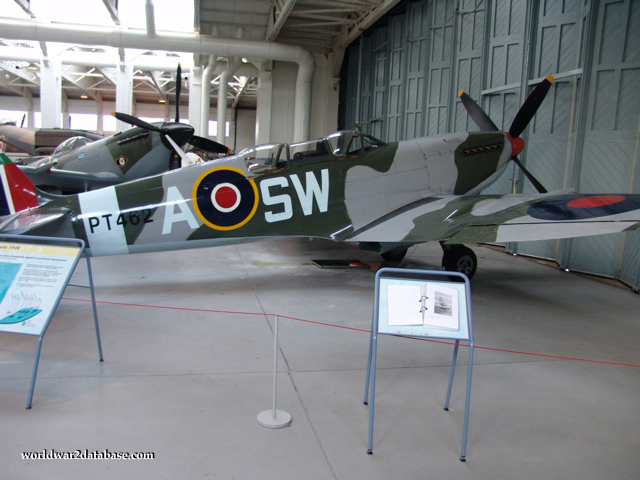 Supermarine Spitfire Mk IXe, serial PT462, has travelled all over the world since it was built at Castle Bromwich, Birmingham, in 1944 as a high altitude fighter to counter the Fw-190. The "e" wing had two 20mm Hispano-Suiza cannons and two .50 caliber Browning machine guns. It arrived in Italy on August 23, 1944 and served with RAF 253 Squadron and also the Royal South African Air Force until 1947 when it was transferred to the Italian Air Force and later the Israeli Defense Force. It was powered by a Merlin 70 engine when built, in the 1987 rebuild, a Merlin 66 and a second cockpit was added. It transferred owners several times after the war and was rebuilt several times, coming back from the junk pile at least twice. Note the other Spitfire behind it.